ARTSCAPE Magazine reflects the cultural and artistic activities of the Angel Orensanz Foundation, a Manhattan-based organization for the arts and culture. Operating from a historic gothic-inspired building first built in 1849, the Foundation seeks to absorb and maintain the artistic energy that pervades the New York City community. Lower Manhattan, especially the Lower East Side, serves as a hub for various artists and their work across a variety of fields throughout history: examples include Leaves of Grass by Walt Whitman, and Emma Goldmanʼs Anarchism and Other Essays. Maintaining this tradition of arts cultivation, the Angel Orensanz Foundation has been a platform for artists such as Elliot Carter, Florence and the Machine, and the Black Eyed Peas. In 1994, the Orensanz hosted a highly controversial and boundary-defying production of Rainer Fassbinderʼs Garbage, The City and Death. Today, it continues to exhibit the works of artists including, but not limited to, Caroline Bergonzi, Amparo Garzon, Hangarʼt, and founding sculptor, Angel Orensanz. ARTSCAPE Magazine serves as a conduit between the affairs of the Foundation and the network of producing artists and innovators throughout New York City. 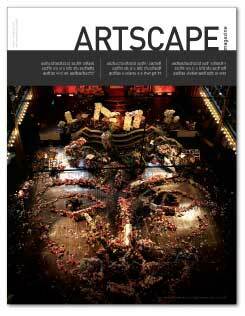 By presenting content that relates art to implications of society and global culture, ARTSCAPE provides up-to-date arts-news coverage in the universally accessible format of vivid imagery and engaging texts. The goal remains, as always, to spark conversation and foster connectivity in an ever-expanding and ever-changing city.